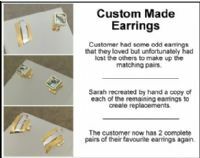 Do any of your favourite earrings need to be repaired or replaced? Has a stone fallen out of one of your earrings, or has it come away from the post or clip? We work with every style of earring, from studs, hoops and creoles to drop earrings and clip-ons. Often it’s the earring fitting that breaks from wear and tear – the post/stem or hook, or the clasp for clip-ons. Sometimes a precious or semi-precious stone will fall out, in which case we can provide a match based on the remaining intact earring and place it securely in its setting. 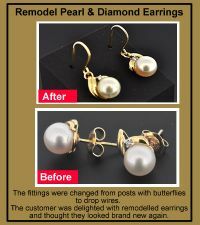 We can even adapt a favourite pair of earrings, such as changing clip earrings to pierced and vice versa, and adapting drop earrings to studs. This is a popular option for making family heirlooms passed through the generations more wearable and contemporary.